Many years ago we molded golf clubs driving heads much thicker than 25mm. One solution (also used for a number of other thick walled products) was to mold an insert to leave say a minimum 3mm wall depending on strength needed. The insert was made of all the regrind sometimes contaminated material. 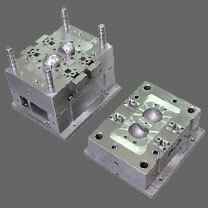 Molded at quite a fast cycle as distortion was not usually important for the insert. An extra mould and an extra operation but often proved economical with reduction in overall cycle time and material costs. If it's in semi crystalline material, you will probably not get the strength you are aiming for. The uniform thick parts will require a good molding process with controlled holding pressure. If it is for design, consider the gas-assisted moulding. It uses less material but the cycle is usually longer as the inside gas pocket cools the material quite poorly. If the design for gas-assisted molding has a Y-shape for the gas to flow in. The gas will go one way or the other - never both. The worst case is if the 25 mm is a minimum thickness you must feed through thinner walls. Then you will have no control of shrinkage and deformation. A fair water cooling in the mold should be fine. The limiter is transporting the heat from the core of the part to the outer surface. Plastic is a fairly good insulator and the steel will always remove the calories faster. Uniform thickness can be dealt with, given the correct part design, material selection and the expectations of the finished parts. In fact, years ago when the technology of projection TV was in it's early years and the projectors were typically mounted on the ceiling of the room, the large plastic lenses were injection molded. There were 3 lenses assemblies in the units. One each for red, blue and green. The lenses were between 5" and 10" in diameter. Depending on the size of the projector. The large lenses were about 2" thick in the center. The optics/surface profile had to be perfect. If not, the unit had severe distortion of the picture and focus issues. The cycle times were extremely long, several minutes-- 10 minutes or more. But the parts were very expensive and for very expensive products. Unless you were to actually hold one, you would think that they were ground and polished glass lenses. The company which made these specialized in the manufacture of plastic lenses for various products.